As a child I always took the stories of the Tanakh (Jewish Bible) on face value or at least to the extent I could understand. While questioning was not frowned upon, it seemed easier to go along with the story being that day in Hebrew School. Did it really matter what happened between Cain and Abel, Isaac and Ishmael, Jacob and Esau…or was the moral of the story the greater lesson? In High School we read Shakespeare and learning about the time in which (we believe) Shakespeare lived was just as important as his works. What did the world around him look like that created such a brilliant mind, what empowered and inspired his writing. That same question can be asked of the Torah. 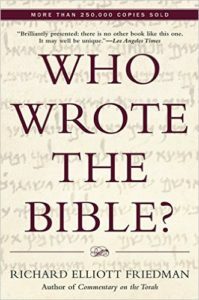 Professor Richard Elliot Friedman, the author of Who Wrote the Bible looked at the Torah through the very same lens that literary scholars look at Shakespeare, Whitman or Twain. There are those that argue that Torah is the direct word of God and others who decry this idea saying it is no more than a history book. Personally, I believe the truth lies somewhere in the middle, why can’t the Torah be both human and divine. Why can it not be a narrative of our peoples past and its connection to ancient God that led them through the wilderness. Last week Professor Friedman was on the new podcast Judaism Unbound discussing his book and the impact it has made over the past 30 years. I strongly encourage you to listen as he takes listeners through his own process and explains modern day Biblical criticism. I strongly encourage you to listen and let me know your thoughts.